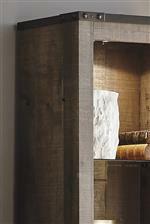 Replicated oak grain takes the look of rustic reclaimed wood on tall pier bookcase. Two glass shelves and a built-in light to make it easy to showcase decorative accents. Its top metal banding with rivet look at the corners and simple metal drawer hardware amplifies the cool character of the pier. It's perfect for use as a bookcase or with the coordinating TV stand. The Trinell Tall Pier with Door, Glass Shelves, and Light by Signature Design by Ashley at Michael's Furniture Warehouse in the San Fernando & Los Angeles area. Product availability may vary. Contact us for the most current availability on this product. Storage 2 glass shelves, fixed shelf. Inside door: 1 fixed shelf, 1 adjustable shelf. Go for a vintage casual for your entertainment space with this collection. Its replicated oak grain has a brown finish with shade variations and gray undertones with a plank style to recreate the look of reclaimed wood at an affordable price. 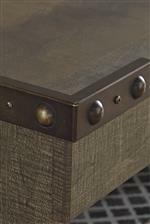 Metal banding with rivet like details adds industrial character to each piece. The Trinell collection is a great option if you are looking for Vintage Casual furniture in the San Fernando & Los Angeles area. 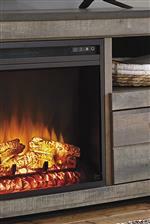 Browse other items in the Trinell collection from Michael's Furniture Warehouse in the San Fernando & Los Angeles area.